Undergrads can apply by Feb. 16 to get at-sea training and do graduate-level research with Aggie oceanographers. 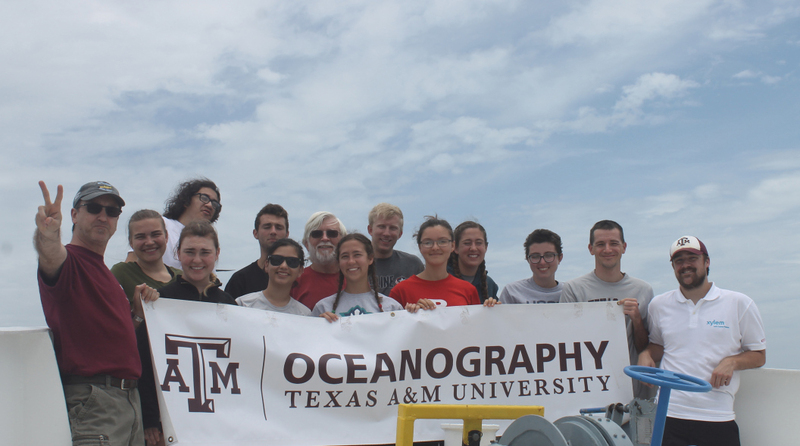 Students from around the country are invited to apply to the Observing the Ocean Research Experience for Undergraduates (REU), hosted by the Texas A&M University Department of Oceanography and the Texas A&M Geochemical and Environmental Research Group. The program accepts 10 undergraduate students, and each receives focused mentoring from faculty, faculty assistance in developing a research plan, and graduate-level training in sensors, data analysis, data management and science writing. This summer the program’s research focus areas are hypoxia, harmful algae, oil spills and ocean acidification. As a group, the students will develop a glider mission and deploy a glider during a research cruise. Applications must be submitted by Feb 16, 2018. 2017 REU participant students aboard the R/V Pelican for their research cruise. The National Science Foundation funds the nationwide REU program, and the College of Geosciences at Texas A&M University helps host three REUs, including this one. Also visit the Observing the Ocean REU Blog to check out previous participants’ research and photos.